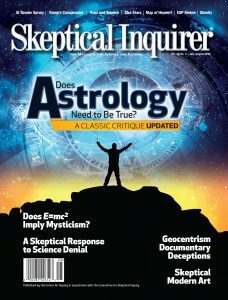 Thirty years ago, although dozens of tests had been mostly negative, astrologers said critics had ignored serious astrology. Now there are hundreds of tests, some of them even heroic. Has anything changed? Science denial has a corrosive effect on deli- cately understood scientific concepts, and it is getting worse. But science itself holds an answer. The question of the relationship between art and science remains fascinating and open. Before trying to explain something, first be sure that it really occurred. Until now, the Phoenix Lights were simply that: they were just lights in the sky, skeptics and proponents could agree. Political Divisions Will Affect American Beliefs about the Zika Threat. Does E = mc2 Imply Mysticism? Does the Universe Revolve around Me? Obesity: ‘Fat Chance’ or Failure of Sincerity?